So today - we will address "Proportion"
What are the dimensions of your table? What shape is your table? Is it glass topped or wood topped? 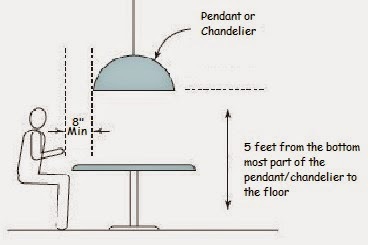 The ceiling height truly sets the basics for the dimension the chandelier should be.... An industry standard that we utilize in our designs is that the bottom of the chandelier should be 5 feet off the floor over a table. Yes - off the floor..... Now this is just the first half of the equation - so stay with me here...... If your ceiling is 10 feet tall and we want the bottom of the light 5 feet off the floor - then that means we have 5 feet to fill....... We like to see proportion/balance between fixture and the chain used to hang it....... So in this case we would want a fixture that is at least 30" tall (minimum) and not to exceed 42" tall. This has become one of the more important variables mainly because of the longer "harvest" tables that we have been seeing in design for the last couple of years. We want to be sure to compliment and enhance the dining room as a whole - so if we have a really long table with a small round chandelier hung in the center it can look unbalanced - not to mention the fact that we probably won't be providing adequate light, but that is another blog..... Needless to say - the shape of the table should be thought about when choosing the chandelier. Keep in mind..... This chandelier will hang over this table 365 days a year, so we want to address the "every day" shape NOT the shape when you put the "leafs" in it a couple of times a year. Design by Chelsea Whitman of Whitman Interiors with Downtown fixtures from Quoizel by Lighting Etc. 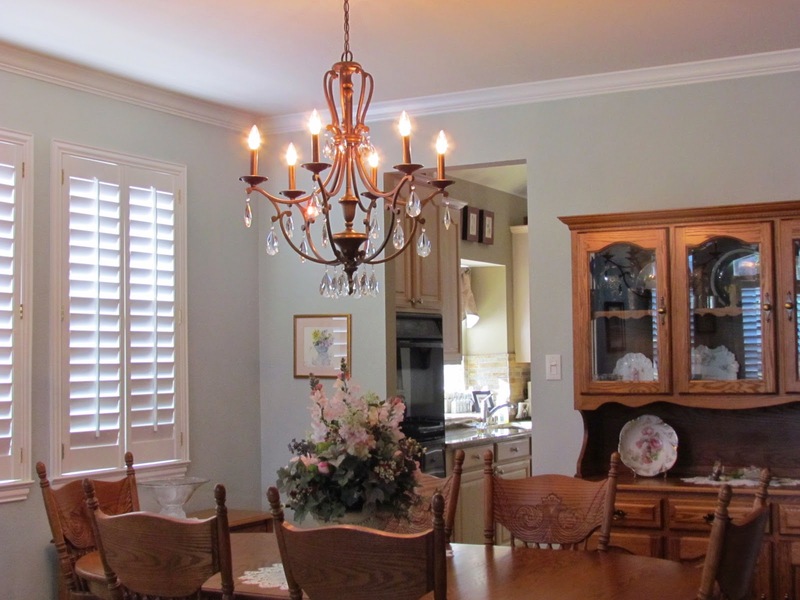 Design by Tiffany McKinzie Interiors with Cesto fixture from Corbett by Lighting Etc. One of the last questions that I ask for "proportional" info is whether your table is glass topped or wood topped. If you have a wood topped table we need to balance the visual weight of that table - meaning - the frame structure of the light can be fuller and heavier to balance out the wood below it. Same is true for a glass topped table, because the glass is transparent the light fixture can have a finer frame and simpler structure so as not to be too heavy looking. This being said - please keep in mind that "design" is personal. It is your home and you can have whatever makes you happy. Design by the Parsons Family with Claybourne fixture from Capital by Lighting Etc. Design by Kevin Wolfe with Autumn Twilight fixture from Golden by Lighting Etc.